I am short in Nifty, What should i do ? This is one question which i have not been able to answer in this weekend. 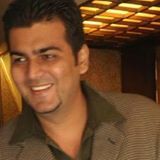 If it tell people that i expect 20500 odd and 6150 odd on Sensex and Nifty and thereafter a decent correction. The next question pops is uske baad to ghirega na. Should i average my position or exit my position. For now my technical view has been the same that Sensex trend has changed highly positive and the target implication is 20500. Let us look into the technical chart below to get a cleaner view. As for me whenever i have to take a trade it doesnt matter to me what position i have ( For example when looking into the portfolio there is no buying price mentioned in the excelsheet) So every decision is dependent purely on current market condition. 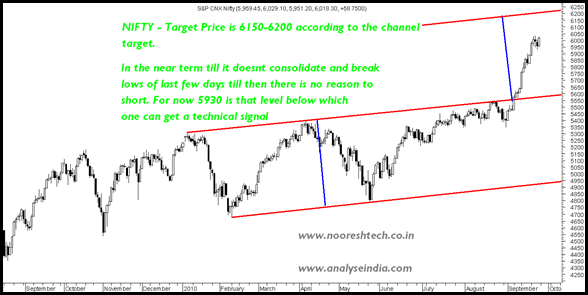 For Nifty my technical target is 6150-6200 as one can see from the channel. But at these levels one can look for a long but the risk-reward is not favorable as we may have just a 100 pointer upside but downsides we never know with such a huge move. In the last few days index has not broken the lows made day on day. Till it does not give such a signal i have no reason to short. For now such a level is 5930. In simpler terms at 6150-6200 i might have a decent risk-reward to take a speculative short. Or below 5930 might have a short term trend signal. Although this may not answer the question I am Short on Nifty,What should i do? The only answer to it why did you go short. The answer to this is how does one get into the trade - For a decent trader below is a checklist. Although this might be a quick one as every trader has over period of time evolved a intuitive process. 2) Conviction/Probability of success as per system. Stock Trading is a very easy Business. This is the exact question that I’m asking to everyone related to markets in the last two weeks.. I’m trapped with short at 5850 for the first time and then while averaging it at 5930 🙁 Even your question of why did you go short is also a perfect one.. But, whats the ans please? As per the charts, I may need to average at 6150-6200 I guess..
Can you please advise on Malu Paper? Bought it at 20…Do you want me to exit the stock or hold on? Dear nifty Short holders When you shorted nifty there must be some basis in your mind for shorting and you did not squared off your position even that basis of shorting proved invalid. Now to minimise loss you can short put options of nifty i.e. PE – 5900 and PE – 5800 in equal quantity. This will not recover all your lossed but will reduce your losses. If market goes down and you may incurr loss on PE sold you will be offset by reduction of loss on future position. Also you can buy CE- 6100 so that if market rises you will be benefited and to some extent your losses will be reduced. Once downtrend is confirmed than take right position and who knows after two trades you may come in proft overall. End of day trading is game of probabilities only. Thanks for your call. I have bought NTPC @ 207/- ….now CMP @ 214.60. As per your call should I exit @ 218/225 or Should I hold for more ? If market corrects, this NTPC will also correct…how far it may come down ? We need a group of interested people in Hyderabad to do it. What do advice about IDFC should I buy or wait ? I can invest long time like 6 months to one year. please advice.